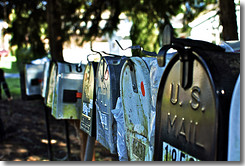 Why address an email message to 10 people when you can address it to one? If you often send email messages to a group of of people — library board trustees, members of your Friends group, volunteers, etc. — it pays to create a Distribution List or Contact Group to make it easy on yourself. A Distribution List (Outlook 2007) or Contact Group (Outlook 2010) is a grouping of email addresses collected under one Contact name. Whenever you send a message to a List or Group, it goes to every e-mail address in that list. You can use your List or Group just like any other email address when composing your message. The name of the distribution can be put in the To:, Cc: or Bcc fields. The name you assign to a distribution list does not display when the recipients get their email message; recipients will just see the full listing of all the names in the distribution list. From their perspective, they don't even know you're using a distribution list! Just follow the steps at Microsoft's Create and Edit an Outlook 2007 Distribution List, or Create and edit an Outlook 2010 Contact Group or watch this 2-minute video to see how easy it is to create your own Distribution List or Contact Group!